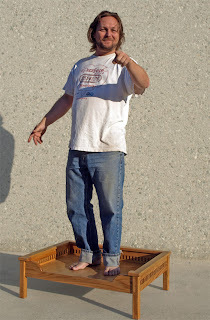 The Barefoot Woodworker has joined up with some great bloggers to offer you wonderful prizes! Yes, that's 3 BIG ONES to one lucky reader! What would you do with an extra $300 in your pocket? 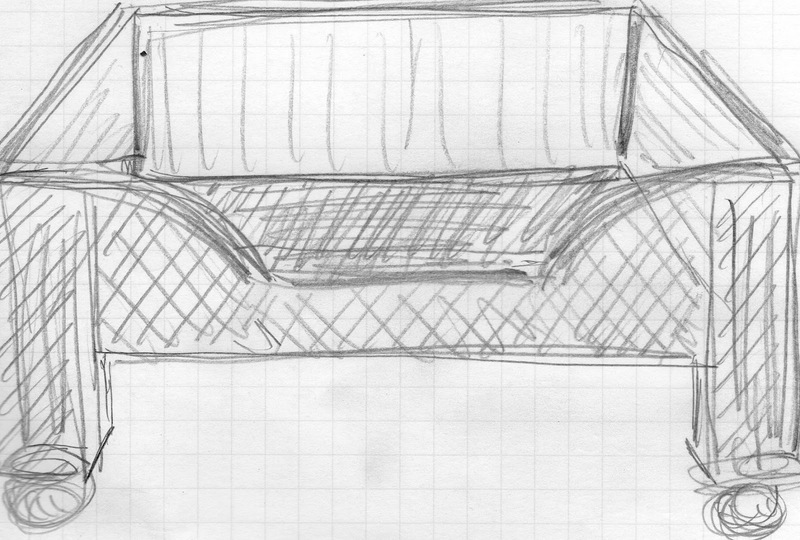 Well I've been plugging away on it and finally have some time to give a small update here. After working on getting the shape on the lathe with tools, there's a need to get it nice and smooth. 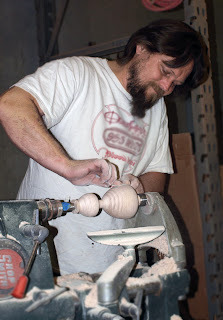 The easiest way it to leave it on the lathe and use sandpaper. I'll tell you though, that sandpaper gets pretty hot in your hands. So it's a lot faster sanding this way, but it means you have to stop and blow on your fingers a lot! You may also notice I was able to make another smaller heart at the base of the larger one. 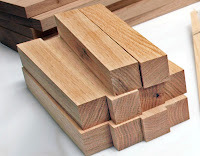 It just seemed like it was worth a shot instead of losing so much of that beautiful figured maple. 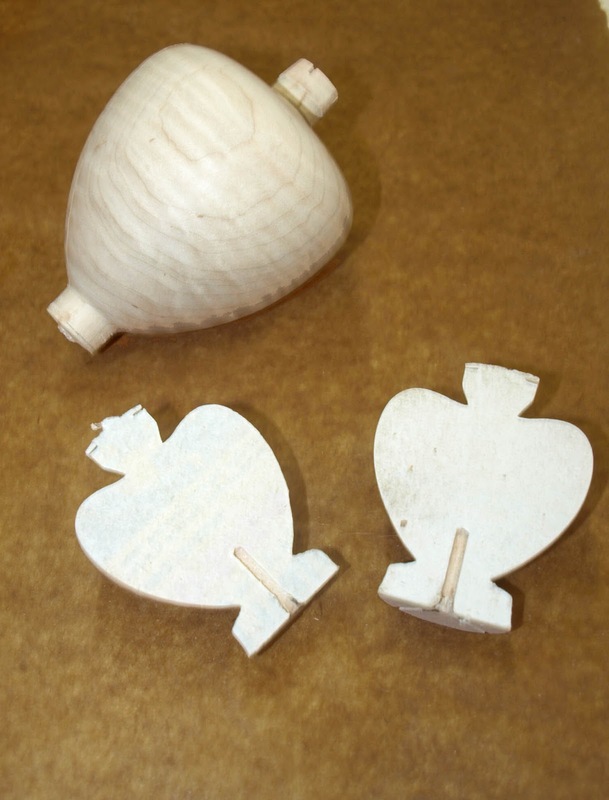 Of the 4 cylinders I was able to make 3 small hearts - the forth having shattered. You'll see the paper that was put between makes a nice clean place for the glue to split back open without losing any of the wood. And we are starting to see that heart shape. First we'd like to congratulate our winner of the Tic Tac Toe game! But we are ready to go on our next contest. This will be a short one so hurry and get on board! While you are running around the internet to win our cool handmade swag, please take a moment to support small businesses at www.MissionSmallBusiness.com. Each vote adds $5 to the grant pool so more small businesses can get some much needed funds. And we'd really appreciate a vote for us (CUSTOM CLASSICS in Anaheim, CA) while you are at it! 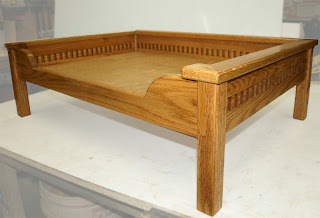 Thanks from the Barefoot Woodworker. The dog beds are finished. 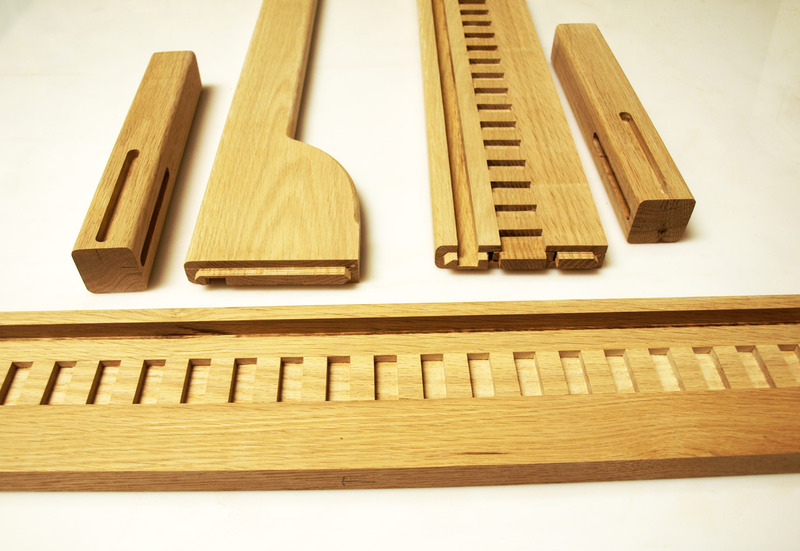 After the last step we showed of using square pegs in round holes, we put a finish on them. They are looking really good and have a rich tone to the color.And you'll notice I stand behind their strength. Well, more like I stand ON in this case! Nature VS. nurture?....That's the time old question isn't it? Well I believe BOTH...but not in the traditional manor. I believe that a normal healthy mind is capable of ALL things at conception....natures bounty if you will. Then we nurture it into oblivion! The only thing that stops this is the individuals personal desires. When I was in preschool, at about 4yrs old, I was told it wasn't possible to put the square peg in the round hole in that little toy with all the shapes (shape sorter?) - I STRONGLY DISAGREED - I got in trouble with the teacher.... In those days they were made of wood LOL (yeah I'm old....so are most are you so give me a break LOL). 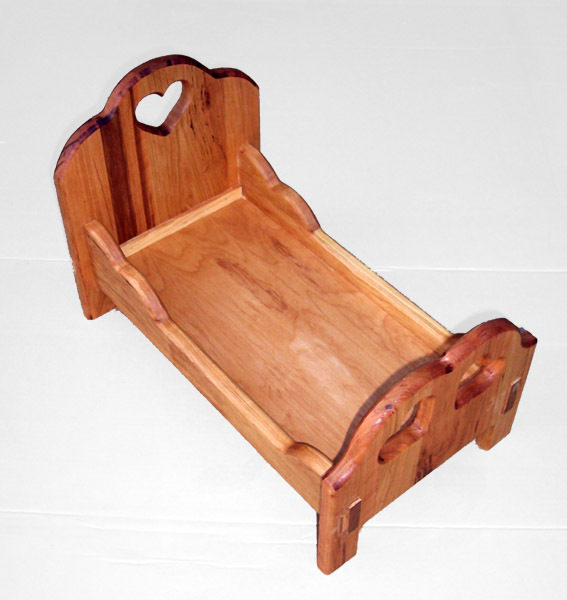 Then at recess they gave me the shape sorter...and a small ball peen hammer (metal) I spent all recess diligently working with small taps and put the square peg into the round hole. I was VERY proud of myself! I had proven my point! Again, I got into trouble....with the teacher, principal and MOM (she had to pay for it LOL). I don't believe anything is impossible. -I- may not be able to do it. -You- may not be able to do it., but somewhere at some point in time someone was able, can now or will be able to do it simple because someone said "YOU CAN'T". 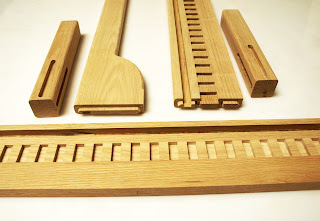 Today almost 40yrs later I've almost perfected putting square pegs into round holes as represented in my furniture produced. My mother seemed disappointed when I told her about it yrs ago....I guess my nature was stronger than my surrounding nurture. 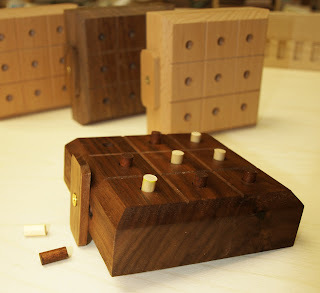 Enter to win this adorable handmade Tic Tac Toe game! Choice of 1 dark (walnut) or light (beech) wood. and yes I made it! You do it all to drive your business forward. Chase and LivingSocial want to help fuel that drive by awarding up to 12 individual grants of $250,000 to 12 small businesses. Submit your Mission: Small Business℠ application today! • be deemed eligible by the Sponsors. Then come back here and list your business in the comments below so we can vote for you too! We ask that you consider voting for others in the comments list. . and come back to see more who have voted for you! Don't have a business but want to help! Vote for your favorite small businesses in your community. Consumers may vote an unlimited number of times but only once for each small business. Each business needs at least 250 votes to be considered for a $250,000 grant. Eligible small business applicants will then be judged by a panel of business experts. This grant is an amazing opportunity. We are trying to garner votes for this endeavor. 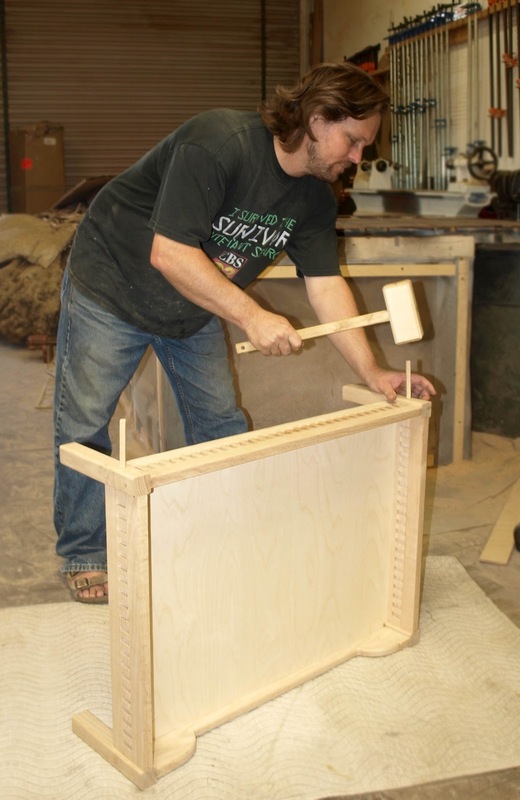 This grant would allow us to complete ambitious projects that achieve three major goals: growth of our business, continued charitable presence in our local community, and becoming a woodworking educational presence (starting apprenticeship programs) in the online and local community. This would change our lives and the lives of others as well. Please consider voting for us. Custom Classics in Anaheim, CA. Don't forget to put your business in the comments so we (and others) can vote for you! Each vote adds $5 to the grant pool so more people can get grants! 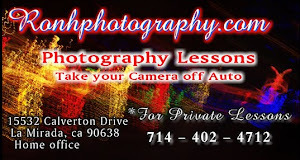 Help us and help small businesses! Along with the intriguing heart shaped jewelry box, I've got a few other projects in progress in the shop. 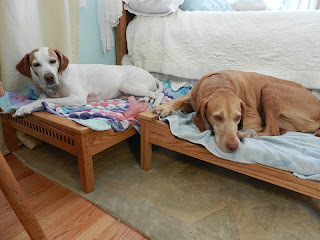 I had a request for 2 dog beds. Here's the dog bed she saw that made her ask for 2 for her larger, heavier dogs. 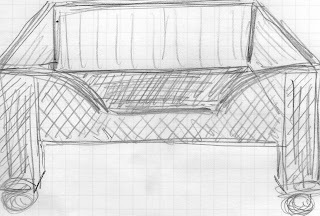 But she wanted a style more in keeping with her current bedroom furniture. We need your help. 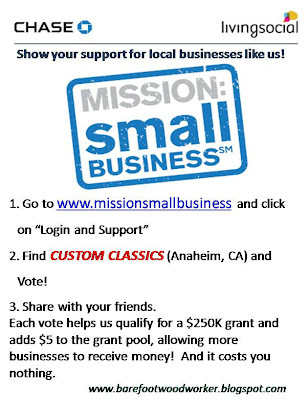 Help us receive 250 votes on the Mission: Small Business℠ page to get closer to qualifying for a $250,000 Grant. 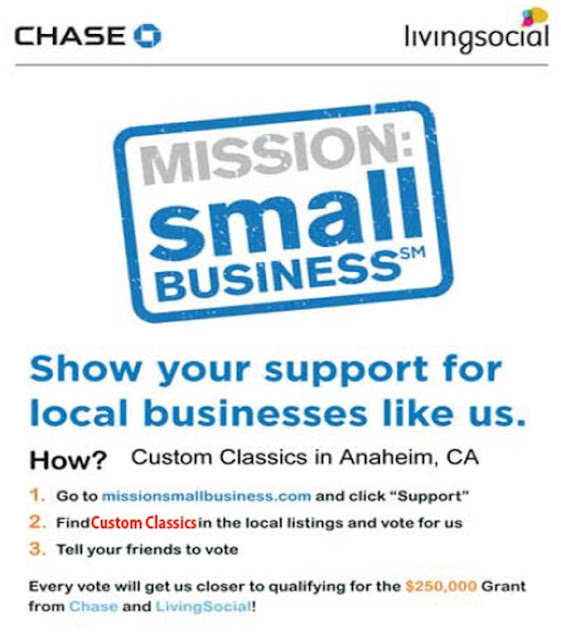 Go to www.missionsmallbusiness.com After clicking “Log in and Support” on the home page, look for our business, CUSTOM CLASSICS, (it's what the CC stands for) and vote for us! Please forward to anyone and everyone.